here in maryland theres not a lot to do. mostly me and my friends just hang out. the local cops dont like this and neither do the business owners. so alot of times we end up in parks or "parking" spots. on this night 8 people were gathered at this location in 4 cars. we all met up in town around 8-9 in the evening. thew cops decided too many people were gathering and chased us off. one local drinking or partying spot is nicknamed the "lodges". basically its gunpowder state park. a well known local fishing hole, the subject to indian related ghost stories and a middle of nowhere spot in the middle of civilization. we decided to head there. we arrived around 10. we proceeded on the usual chatting of whos car is faster, whos dating who and such. some people were using drugs. one or two had been drinking. me, my friend tom and jason were not on this night. we all sat pretty quietly in our cars. nobody had been out accept for the occasional rearranging of seating for close to 4 hours. i do remember that it was very cold that night for our area. probably around 40 degrees? and it was definetly before halloween, since we werre making plans. three cars were facing forwards. my 87 mustang toms 68 mustang and brians dodge omni. the other ones were not. we were all parked side by side in a row facing a almost 45 degree grade of dense shrubs and 15- 30 foot tall trees. the road (bottom rd.) was in front and the bend in the stream was behind us with boulders and shrubs all around.lighting wasnt the best, but enough to make out the trees close to 50 feet away and ground cover around them.the area is almost indescribable. i could draw it for you or get a picture possibly. what happened was around 2-3 o clock we all stop talking to the noise of what sounded like someone running through the woods. i figued it was a deer. then you hear it crashing down the hill in front of us. this sounded like someone taking a running step down the side of a steep, loose gravel hill, breaking off limbs and whtever else they could grab to help slow them down. then- plop- out onto the road lands this human figure. i was looking down at this point. in the car next to me tommy goes "jesus christ" and i look up to see a dark huge figure hunch over to look back at us. instinctlively brian in the omni and i pull on our headlights almost at the same time. it was still a little hazy from the stream behind us and all i personally could make out by the time my eyes refocused was what looked like a humanoid figure, close to 8 foot tall, sprinting away from us. i can still destinctly remember the sound of it running away, exactly like someone running barefoot on blacktop or concrete. a slapping noise. i unfroze and got out. so did tommy and brian.we walked up the road a little and i felt really weird. at this point the last word spoken was tommys jesus christ. we all got into our cars. we sat there for about 10 minutes. then simultaneously we turned to each other and said "its getting late" or " im too tired for this" and decided to all head out. NOBODY spoke about this to each other for almost a year. some people that were there still wont talk about it willingly or in front of others. honestly i thought it was a gag at first. theres also alot of indian ghost stories tied to the area because of an indian graveyard. i dont know what it was. i dont care. all i know is that was not a man. and it sure as hell was not a deer.if you guys can explain it any other way for me thats fine. but i have at least 6 other witnesses i can get ahold of for you. alot of time has passed since this happened and alot of construction has happened also. so if it was what you are looking for its long gone now.but after the fact i have heard of a few other sightings like this, including a set of footprints less than 5 miles south of the area and within a year of our encounter.the area is bottom rd. and laurelbrook rd in fallston md. harford co / baltimore co just inside the boundaries of the gunpowder state park. 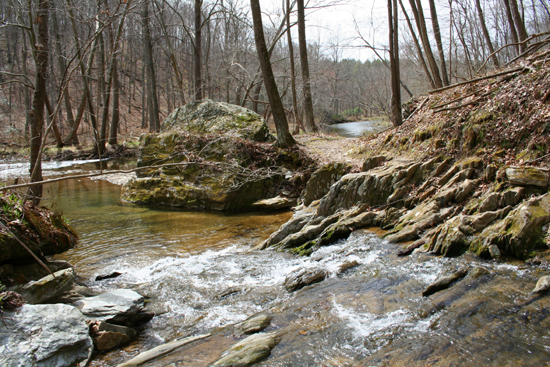 Various activities reported near the Gunpowder River. Large, dark creature seen crossing the road.